In India, we have very few Valuepickr ace Investors. Rakesh Jhunjhunwala, Porinju Veliyath, Vijay Kedia, Daljeet Kohli and Dolly Khanna are among them. 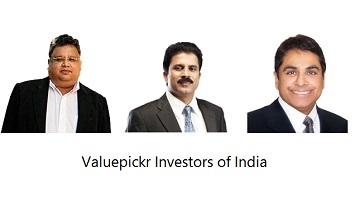 These Valuepickr Investors are kind enough to share their value pick stocks and investment strategy with us. It is us who need to take maximum benefit of their advice and recommendation for wealth generation. In this post, I will share value pick stocks by Valuepickr investors of India. What is Value Pick Stock? Value Pick stock is stock with strong fundamentals, future potential, and trading at a low price. This stock is undervalued (wrongly valued) stock by the market and contains potential to increase in share price. A success of value stock picking relies on the strict screening process. The first value pick stock of valuepickr investor Rakesh Jhunjhunwala is Delta Corp. Delta Corp is largest and only listed company in the gaming and hospitality segment in India. In addition to gaming and entertainment Delta Corp is also in the real estate business. Delta Corp is a pioneer and they have no completion in gaming space. The company has shown a very good financial performance and expected to perform better in the future. The stock has strong fundamental and at CMP of Rs. 175 (As on April,2017) it is a good stock pick. Titagarh Wagons is value pick stock by Porinju Veliyath. Titagarh Wagons is in the business of making wagons, bridges and heavy earth moving equipment. The company has very good order book. Looking at upcoming metro train projects in multiple cities this company is expected to get good business in the future. Strong fundamentals and the healthy order book is a positive side of Titagarh Wagons. At a current level of Rs.120 (As on April,2017) it is a very good stock pick. Valuepickr Investor Vijay Kedia is bullish on banking and financial sector. As per Vijay Kedia stock of Karnataka Bank is a value pick. He has aggressively increased holding in this stock. Karnataka Bank is available at very low price compares to its growth potential. Once upon a time, ICICI bank has attempted to buy Karnataka bank and a possibility of ICICI making another similar attempt cannot be ruled out. At a current level of Rs.160 (As on April,2017) it is grossly undervalued stock with very good potential. The last value pick stock by valuepickr Dolly Khanna is Tata Metaliks. Although Tata Metaliks has given a very good return in past still there is a juice in this stock. Tata Metaliks is in the fastest growing business of DI pipes with limited completion and solid demand. The stock is undervalued with very good potential to show a hefty gain in the future. What is your call on above Value Picks? Too Good value pick advisable stock investment purpose .Be continuous for us these type of advisable stock for good fundamental, potential to earn future prospective.